Can My Pet Get Depressed? Unlike humans, most pets seem to be in perpetually good moods. They're ecstatic when you arrive home from work, are always ready to play and enjoy keeping you company whether you're cooking dinner or cleaning the garage. When your pet seems sad and is no longer interested in the little things that used to make him or her happy, it's only natural to wonder if depression is the cause. Pet behavioral experts believe that animals probably do suffer from depression when they face upsetting situations. Symptoms of depression often occur after a life-changing event, such as a move to a new home, a family member moving out or the death of a pet or family member. Often, it takes a little detective work to determine what may have caused your pet's condition. Decrease in Activity Level. 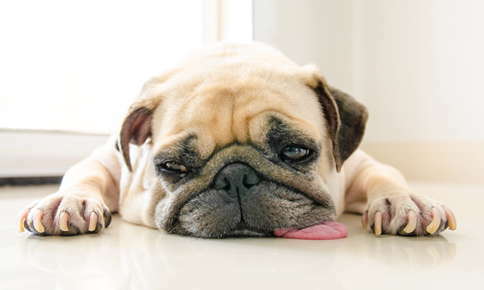 You may notice that your pet seems a little lethargic and uninterested in doing much more than sleeping or resting. Loss of Appetite. Depressed pets often aren't interested in eating and may begin to lose weight. Lack of Interest in Playing. Fetch, chase-the-laser-light and other games may fail to interest a pet who's depressed. Reduced Interaction with People. Depressed pets just want to be alone. They may stop greeting you at the door or find a hiding place under a bed or table. Feather Plucking. Birds may pluck their feathers and look disheveled if they're depressed. It's a good idea to schedule a visit with the veterinarian if your pet's symptoms continue for longer than two weeks. Because many of the symptoms of depression can also occur if your pet is ill, it's important to rule out illnesses and conditions that can affect behavior. For example, diabetes or kidney failure may cause your pet to feel tired and lose interest in his or her usual activities. Older pets that seem depressed may actually be suffering from arthritis. When standing, walking or running is painful, going for long walks or even staying by your side while you cook dinner may no longer be enjoyable. Spending More Time with Him or Her. Depressed pets may not seek you out, but they'll still benefit from increased time with you and other family members. If your pet seems depressed after your child leaves for college or you change your work schedule, paying a little more attention to your furry friend may help him or her adjust. Brushing or Grooming Your Pet. Depressed pets may not have the energy to groom themselves. Brushing will help improve your pet's appearance and offer additional opportunities for the two of you to spend more time together. Paying Attention to Socialization Needs. Some pets do better as only pets, while others, like guinea pigs, will become depressed if they don't have companions. Encouraging Your Pet to Play. Pets, particularly younger animals, may exhibit signs of depression if they're bored. New toys that make noise, light up or contain catnip make playtime more enjoyable for pets tired of the same old squeaky toy. Dogs can easily become bored if they're sent to the backyard for hours on end with no human interaction. Playing games with your dog in the yard or taking him or her for walks or trips to the dog park can improve your pet's mood and help you get a little exercise. Keeping the Same Routines. A move to a new home or a new job may require that you make a few changes to your routine. Despite the changes to your schedule, it's important to keep your pet's routine as predictable as possible. Offering Treats. If your pet has lost interest in his or her usual food, offer treats and foods that may not be a regular part of your pet's diet, such as baked chicken, lamb or salmon. Considering Medication. Medication isn't usually recommended unless your pet is severely depressed, but may be helpful in some cases. Are you concerned about changes in your pet's mood or behavior? Call us to schedule an appointment. We'll perform a thorough examination, treat any underlying health conditions and offer suggestions that will help your pet feel better.